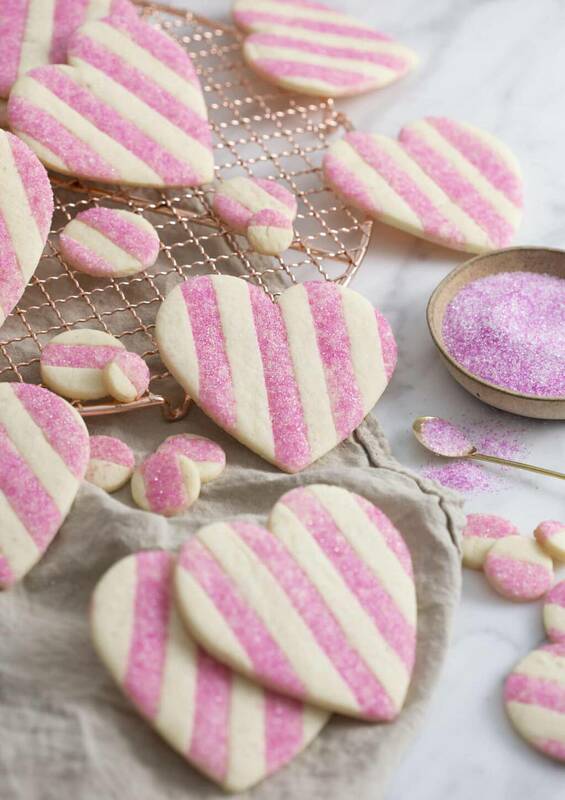 Beautiful striped pink and white heart-shaped Valentine cookies with a little extra sparkle make for a scrumptious treat! 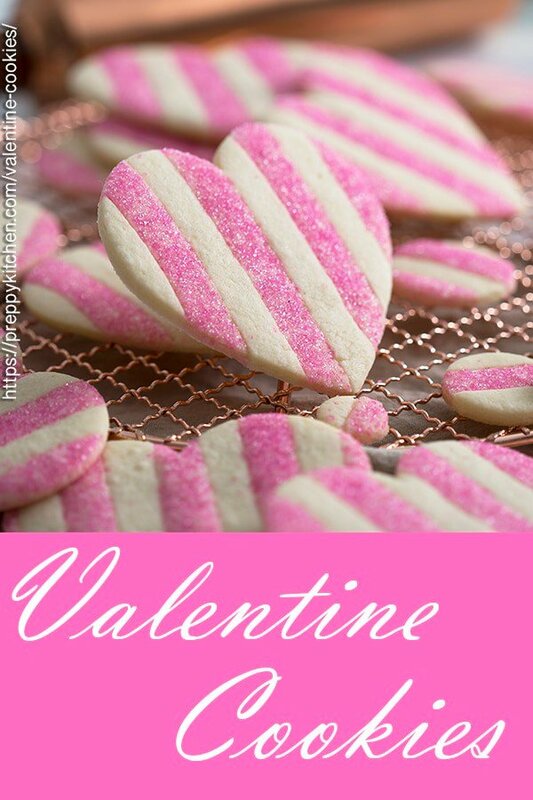 These Valentine cookies come out of the oven fully decorated! All the color and wow factor without the need to mix up batches of royal icing! 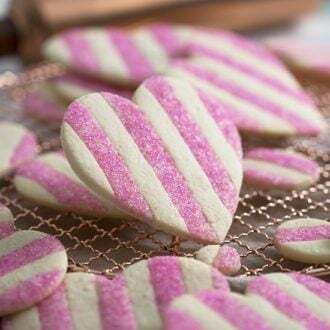 I made them with some pink sanding sugar rolled into the pink stripes for an extra sparkly pop but they look just as nice plain. How do You Make Valentine Cookies? 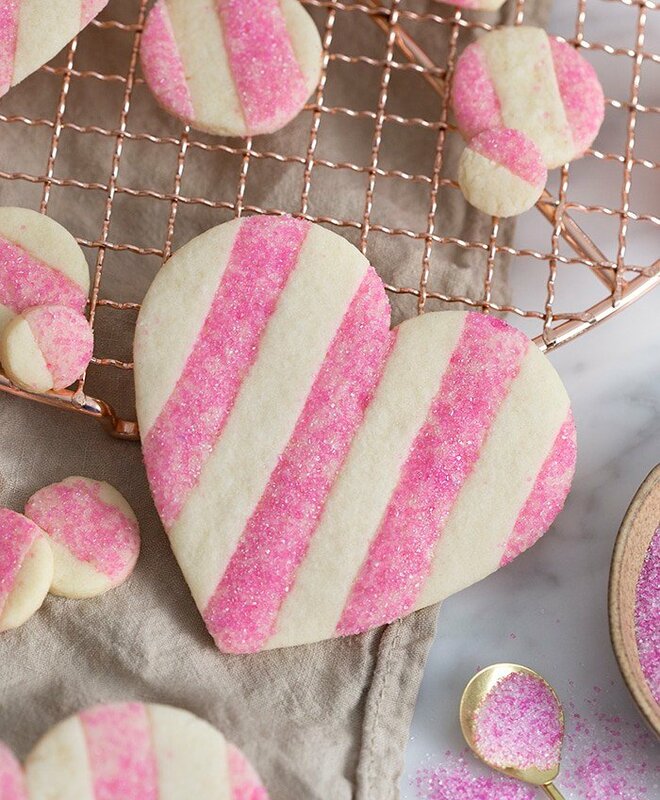 Making striped cookies is so fun, they come out of the oven fully decorated and gorgeous. Basically you mix up two batches of cookie dough. It’s easiest to add the coloring to the creamed butter mixture and then add the dry in. Chill the rolled out dough, cut into strips and place together, then roll again, chill if needed and cut onto shapes! I’ve made these cookies without the sanding sugar and they’re super-pretty so feel free to omit if you can’t get ahold of pink sanding sugar? The best time to roll that sanding sugar on is when the dough has warmed up after the final roll out. If the dough is too cold the sanding sugar won’t stick. Preheat the oven to 375 degrees F. Sift the flour, cornstarch and salt. Give it a whisk so that everything is incorporated. In a standing mixer fitted with a paddle attachment, cream butter, vanilla and granulated sugar together until it’s light and fluffy. Add the eggs to the sugar/butter mixture making sure each egg incorporates before adding the next. Now mix in the dry mixture. When the dough is ready, split the batches in half and add a few drops of pink food coloring to 1 batch. Mix on low until a desired color is reached. Transfer both of the batches to plastic. Roll out the uncolored batch into a disk and then chill it for about one hour. 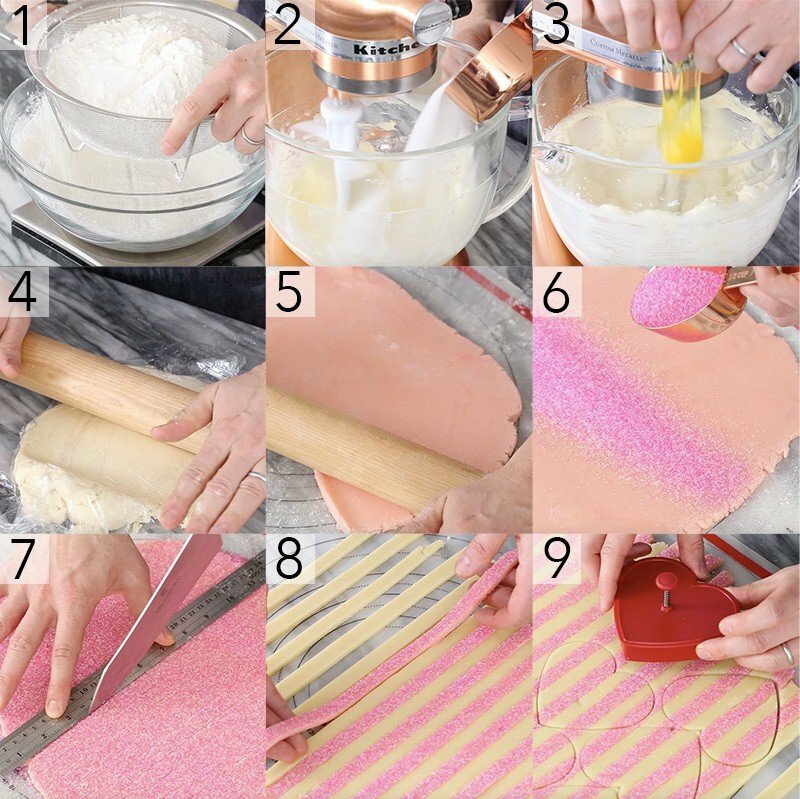 Remove the batch of pink dough from the standing mixer and roll it out to a disk as well. Add ¼ cup of sprinkles to the colored batch. Give it a gentle roll to incorporate the sprinkles into the dough and chill for about one hour. Once both batches are done chilling, roll them out to a 1/4 inch thickness. Using a ruler and a sharp knife, cut ½ inch strips out of both batches of the dough. Layer pink and white stripes so that they are touching and then roll to create a seal. Transfer the dough back to the fridge to chill. Remove the dough from the fridge and cut out the cookies with a heart cookie cutter. Place the cookies on a baking sheet lined with parchment paper or a silat. Bake for 12 minutes, let them cool then enjoy! If you’ve tried these valentine cookies then don’t forget to rate the recipe and let me know how you got on in the comments below, I love hearing from you! I’m not sure what sanding sugar is. Can’t think of what it would be called here in Brazil. We have colored granulated sugar, the grains are bigger than those of normal table sugar, smaller than those of coarse salt if that helps. Would that work? I could try crushing the sugar in a blender/food processor to make it more “sand-like”. One more question: would this recipe work without the eggs? Allergy issues here. Can’t think of a replacement in that case. Love your recipes and Instagram, I’m always sharing your videos. Thanks! I also can’t easily get sanding sugar but found a super easy recipe online, if you can get gel food coloring. Put regular granulated sugar in a zip-top bag (this cookie recipe calls for 1/4 cup, so use a tiny bit more than that). Then drip a drop of gel color onto the sugar in the bag, seal the top, and work the color through the sugar by kneading the bag. It’s easy and quick. If you want the color darker, add another drop, seal, and mix again. Then pour out the sugar onto a parchment paper lined baking sheet and put into a 200°F / 95°C oven for 5-6 min just to dry it out. That’s it. Worked great for this cookie recipe. Speaking of that….first time for me on this site, LOVE your stuff, made the recipe and it came out AMAZING. 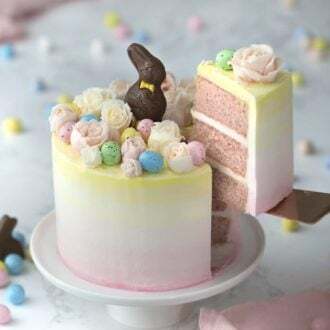 (Even though I weighed the ingredients, was a little weird that my colored dough came out softer than the white dough, for only 3 drops of gel coloring, but i just kept sticking it back in the freezer and it worked out.) Looking forward to trying some more of your recipes, thank you! Thanks Miriam! I’ve got to try that trick out!!! That’s too funny! Thanks for the five star rating! 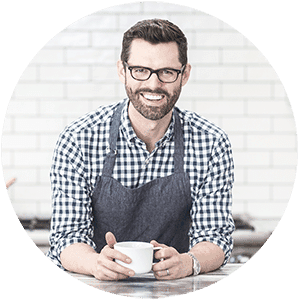 What type of kosher salt to you use when baking? I’ve read on Bon Apetit that since Morton’s is denser than Diamond Crystal, and the results can be dramatically different. Love the videos as always! If I don’t have a standing mixer, would a hand mixer work ok? Yes, you can use a stand mixer. Does it have to be dancing sugar? 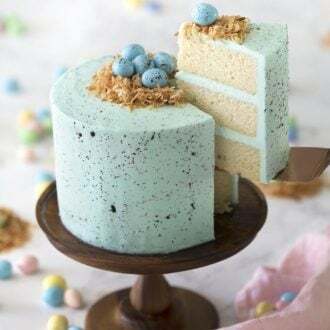 Would regular crystall-like sprinkles work? 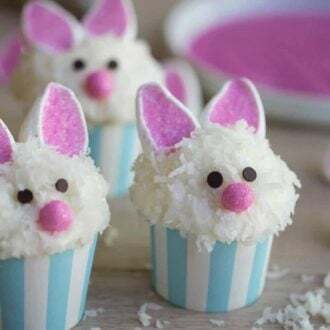 This was so fun & easy…I couldnt find the video till after so went by memory on how to prepare the stripes but they still came out cutesy…even the leftover marbled ones! Thanks! Wish I could post a picture! I’m sure they look wonderful! These are so cute! I linked this recipe to my Valentine’s Day Tea Party article because I love these cookies so much! Thanks! Is a stand mixer needed? It is difficult to buy one at the moment. I think you could use a hand mixer. I wish I had watched the video first. I have been king longer than you have been alive. And even though I know how to scale ingredients, I have never scaled for cookies. It was cold in my kitchen and my butter did not fluff very well and my eggs were cold. Since I didn’t scale my flour I am now confident i had too cut as my dough was so stiff i was adding melted butter a a teaspoon or two of water to get it to hold together. I know better for next time. Only two fell apart! Nd they look amazing… I love the marbled ones as well. First. Of your recipes. Have made, for sure wont be the last. Thanks! I will for sure. Do this with green forSt Patricks day! 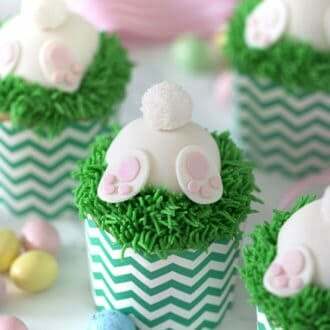 How cute are these!!! Thank you for the recipe…will try it out soon. I made these this evening and they turned out great! I’m adding this to my cookie repertoire. I can see these done with red and green at Christmas time using ornament cutters. Oh my gosh, that’s so sweet! Thank you Nang!! This recipe was a hit! Love the no spread sugar cookie. I was wondering what your suggestion would be to avoid browning of the edges. I’ve made the cookies a few times now at a lower temperature as well as for less time but always have discolored edges. I used the circulating air setting on my oven generally for baking at a slightly lower temp for most recipes with good success. Do you have any recommendations (yours are so beatifully uniform in color!)? I was so happy when I found a way to prevent my cookies from spreading in the oven! As far as the discoloration goes; are you baking these cookies on parchment paper or a silicon baking mat? That will help. These are so cute. They would also be perfect for a girls birthday party.